Just a little babe in the woods. Oh boy. We've been having some hairy times around here lately - to say the least. Crazy cat lady indeed - barking, as the Brits say. Little innocent Tristan just wants to rest and be left alone, but Mr. Poole in particular is showing some rather nasty behavior. Tris can be very loud just when he's about to be fed, but when ambushed or cornered, good grief - what a wail is unleashed!! 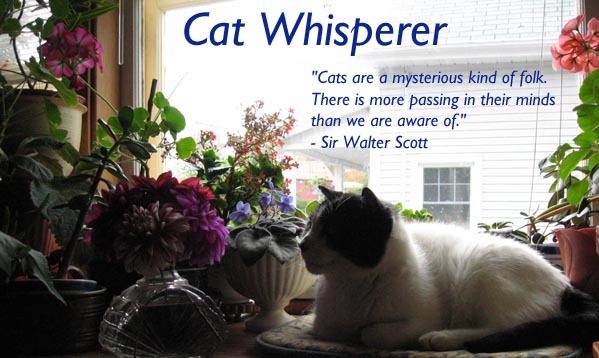 I know that white cats can sometimes be deaf, and while I know for sure he is not deaf, I am wondering if he may be hard of hearing, hence the loudness. Anyway, Mr.P shadows him everywhere - almost likes he's hunting him - kind of creepy to see. Manitou however, is quite relieved as he doesn't seem to be the center of Mr. P's focus quite so much anymore. So - we are hoping "this too shall pass." It's just rather stressful right now. OK, the above was written in a draft about a week ago. And already, we have seen a few but welcome signs of "adaptation". Chesney doesn't freak out quite so much when he comes across Tristan, and Mr.Poole's behaviour has become a little less disturbing, but rather more curious (is he hunting him, or watching over him?). Over the weekend I observed more than one instance where Mr. Poole slowly tried to creep up on an unsuspecting Tristan, only to be thoroughly disappointed when Tristan turned to see him, and as if to say, "oh -it's only you", continued his nap, his grass-munching, or whatever he was engaged with prior to the "attack". Each time, Mr. Poole seemed most disappointed that his seemingly well-crafted attempt to spook the new guy failed yet again. Amazingly, each time he then chose to simply lie down near him. Hmm. An even more surprising discovery was made just 2 nights ago: Tristan on the spare bed fast asleep, with Mr. Poole equally deep in slumber less than a foot away. Hmm again. Much later, sometime in the middle of the night, a couple of signature Tristan wails came from spare room, but as I listened with trepidation, nothing further was heard, and all was quiet and peaceful again. We take it a day at a time - grateful for the smallest of signs of improvement. Doesn't he just need a straw to chew on? "Why yes'm, I's the Qu'aboodle Ranch (Townships Branch) cat-wrangler - every good home needs one - got some cats that need wranglin', and I'm yer man - straighten' 'em out in no time. Just pay me with a mint julep or two - and not the sissy kind either." And in others news, of sorts, the weather lately has been lovely, very spring-like, just how I like it. But now, a snowfall warning has been issued! Tulips, daffodils and pansies are shivering at the news. It's been sandals and bare legs lately, but very begrudgingly, I had to wear something warmer this morning and most likely will have to the rest of the week. The weather was nice on Sunday but today it is windy and wet. I worked on the yard and put a few new flowers in. The rest are waiting on my porch. Gosh Anya, that sounds a bit like our house with Snuffly and all the other cats. They are trying to make acquaintances of sorts but my resident "cat-wrangler" who in all honesty has trouble disposing of a spider, seems to terrify poor Snuffly who hasn't been seen all morning. Perhaps it is the sight of himself with hose in hand, washing the car? 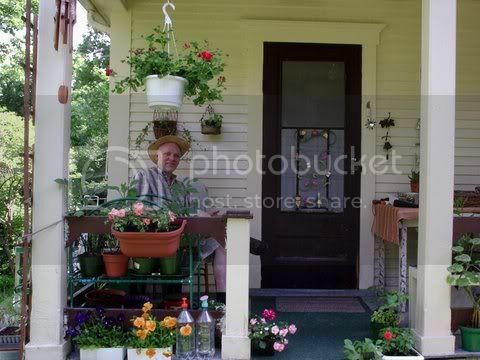 I do love your photos and your tidy porch! The story accompanying your "c-w" is delightful! That's an excellent cat-wrangler you have there! And a lovely porch.